Blogpost crossposted on both CHI+MED and Teaching London Computing sites. 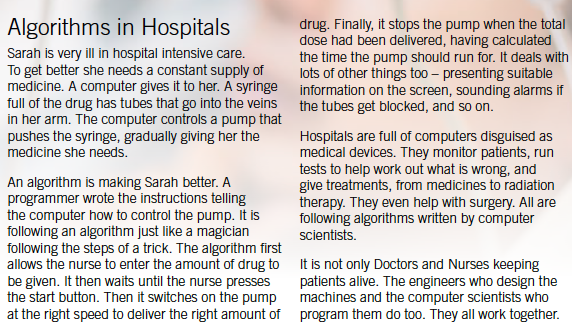 We have a new booklet out which you can download as a PDF (click on the picture below to visit the book’s microsite) and find out more about where “magic meets mistakes, machines and medicine”. cs4fn (Computer Science for Fun) is an outreach project from Queen Mary University of London (QMUL) which aims to enthuse school-aged children about computer science. There’s a website and a magazine (usually two issues a year) with special issues and booklets – this is the latest magic booklet. Paul Curzon and Peter McOwan who set up cs4fn at QMUL are both magicians and also both work on the CHI+MED project and Teaching London Computing. Previous blog posts have referred to to CHI+MED’s use of magic in our public engagement work. “The cs4fn magic books are collections of easy to do magic tricks (mainly simple card tricks). The twist is that every trick comes with a link to some computer science too. That means that as you learn the tricks, you will learn something about what computer scientists get up to too. This comes from page 9 of the booklet. This booklet is published by cs4fn (Computer Science for Fun) in partnership with Teaching London Computing (TLC) and CHI+MED. CHI+MED is funded by the EPSRC and Teaching London Computing by the Mayor of London and the Department for Education. This entry was posted in CHI+MED, CHI+MED people, CHI+MED public engagement, medical devices and tagged algorithms, computer science, computing, Magic of Computer Science 3. Bookmark the permalink.